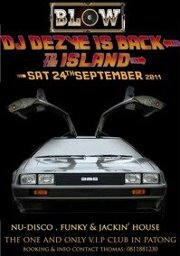 Dj Dezye is back to paradise and he is ready to blow off the roof of BLOW with a really special night of Nu-Disco, Funky & Jackin’ house. We keep surprising you with some special talent from all around the globe!! For table bookings, please use the wall or call 0811881230.